Lighthouse Soccer Club, Philadelphia’s oldest youth soccer club, is a not-for-profit youth soccer organization that sponsors programs for over three-hundred youngsters between the ages of 5 to 18 years old. Serving the Philadelphia community and North American soccer since 1897, Lighthouse Soccer Club has a rich history in national youth soccer; Lighthouse Boys Club (Philadelphia) won national championships in 1938, 1948, 1949, 1957, and 1967. 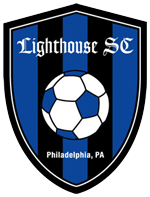 In 2010 Lighthouse Soccer Club was inducted into the Philadelphia Sports Hall of Fame. We will be holding tryouts for various teams this spring. Please click here for dates, times, and registration information. The Club Store is now open to place orders for Lighthouse Soccer Club Puma gear. Prices include the LSC logo. The Store will be upen until November 11, 2017, and then will close to consolidate orders and place them with Puma. Focusing on fun and development, the Lighthouse Soccer Club In-House Program is over 20 years old. Players ages three to eight are introduced to soccer fundamentals in a non-competitive instructional format. Fall Season games for our Lighthouse Soccer Club Boys & Girls Travel Teams begin in September. Lighthouse Soccer Club is always accepting new players but placement with a specific team depends on availability. Our Mens Open and Womens Open teams, known as Lighthouse United, compete in the Inter-County Soccer League. Our teams were founded by a core of players who previously played at local Philadelphia soccer clubs and schools. There are no upcoming games at this time. We are always accepting new players, but space on specific teams is limited.